Some general strategies for addressing these needs in the classroom can be found at Addressing Our Needs: Maslow Comes to Life for Educators and Students. What follows is an Infographic that proposes some of the technology integration strategies that can be used to addressed the different levels of Maslow’s needs. Technology cannot address nor meet biological and physiological needs. Technology is opening new opportunities for everyone, promoting creativity and effective learning. Children and young people are using the Internet more and more, and from an earlier age. The Internet is more assessable than every before. To use technology effectively requires an awareness of both the benefits and the risks. This in turn, has created a world which can be both fun and exciting as well as providing potential dangers and harm. It is important that [educators] and young people are aware of these risks and of the steps you can take to minimize them (Keeping Safe Online). Safety in the age of the Internet revolves around Online Safety, Digital Citizenship, Privacy, and Cyberbullying Prevention. Strategies and lessons related to these topics should not be overlooked. They should be continually taught and reinforced for students of all ages. One of the biggest benefits of the Internet to this generation of learners is their ability to connect with like-minded individuals . . . their tribes throughout the globe. The American Academy of Pediatrics says social media can be beneficial to younger users. For some teens and tweens, social media is the primary way they interact socially, rather than at the mall or a friend’s house. … A large part of this generation’s social and emotional development is occurring while on the Internet and on cellphones. Engagement in social media and online communities can enhance communication, facilitate social interaction (Social Networks: Thinking Of The Children). Educators can become more intentional and strategic in assisting their students in becoming connected learners. Providing learners with the time, resources, permission, and tips for developing their own personal learning networks greatly increases their opportunity to gain a sense of belonging. They can get their social needs met within a global community. Personal Learning Networks have been around for some time. The idea of a PLN is simply a network of people and resources through which you learn and grow. What if we made the building of such a network a central part of the curriculum, inviting students to keep a log or journal of their growing network, and how this network is empowering them to learn, how it is expanding their knowledge and perspective? How are they building a meaningful network? This would genuinely turn schools into places of fishing lessons. Students can interview people around the world, tutor and be tutored, take part in formal and informal learning communities, take part in Twitter chats and Hangouts, learn from and engage in the blogosphere, experience the power of working on a meaningful project in a distributed/virtual team, participate in a massive open online course (or design and teach one), share resources through social bookmarking and other technologies, host and take part in webinars, and build new online and blended learning communities around topics of personal value, need, and interest (Helping Students Develop Personal Learning Networks). People need to sense that they are valued and by others and feel that they are making a contribution to the world. Participation in professional activities, academic accomplishments, athletic or team participation, and personal hobbies can all play a role in fulfilling the esteem needs (Maslow’s Needs Hierarchy). The act of creation has great potential for enhancing one’s esteem. Technology has provided the tools and means for learners to be creators of their own products rather than primarily becoming consumers which is characteristic of 20th century informal and formal learning. They can and do write via blogging and microblogging, make videos, take and post photos and other forms of digital art, perform and record music, create video games, and learn and share their skills online. Not only do learners have the tool available to create. They now can publish their work through online social networking platforms which increases the potential to reach an authentic audience; an audience that has similar interests and can provide valuable feedback. The online world offers kids remarkable opportunities to become literate and creative because young people can now publish ideas not just to their friends, but to the world. And it turns out that when they write for strangers, their sense of “authentic audience” makes them work harder, push themselves further, and create powerful new communicative forms (Teenagers and social networking – it might actually be good for them). Using the internet as a platform for publication gives students the chance to reach an audience the previous generations could not. Still in many schools and classrooms today, students are asked to perform demonstrations of knowledge, skills and understanding before an audience of 1 – the teacher. In many cases the performer is left feeling very unsatisfied, why? We ask students to spend copious amounts of hours perfecting the required aptitude and their reward is the tick of approval from only a single person. Many forward thinking teachers have started using web publishing tools to give their students the opportunity to reach a wider audience, or a very specific one (An Authentic Audience?). Using these freely available forums and tools makes it more likely that the self-esteem needs of achievement, mastery, independence, status, dominance, prestige, managerial responsibility are met. We are living in the age of information abundance. I discussed the idea of information abundance more in depth in Information Abundance and Its Implications for Education. Pertinent to this discussion about assisting learners in meeting their cognitive needs are the following two points. Be a guide on the side, not a sage on the stage. Help students learn the processes and how-to’s of learning. The Internet needs to be open and available to students. Many students already have access to information where and when they want it but often not in the school setting. Many are learning more after school hours than during school hours. By limiting students to textbooks and information as selected by districts, principals, textbook and testing companies, a type of censorship occurs. Students have the opportunity, through the Internet, to hear, see, and read about varying perspectives on so many topics. Depriving them of the opportunity to do so limits their education. The Cognitive Needs can also be met by assisting learners in becoming digital curators. With the right guidance, digitally curating knowledge can help students make sense of the world, uncover hidden passions and reach a deeper level of learning. But it’s up to educators to teach them to do it thoughtfully. “Students are curators, but they don’t know it’s what they’re doing,” said educational technologist Naomi Harm. “They’re sharing things out, but they don’t realize what an educational impact they’re truly making. We as educators need to set the stage for students to be more self-directed in how they curate this knowledge to extend their learning experiences” (Students are knowledge curators — let’s help them use it). The bottom line is that, in this age of open and abundant information, learners can become empowered to access, reflect upon, and share knowledge that they personally find of value. Technology has offered new and unique ways to engage in and meet aesthetic needs. Interest-driven art-making is fueled to a large degree by the surge in new technologies, which have radically transformed the ability to collaborate, share and publish work, affecting the modes, genres, and ways of art-making today. Many young people are creating original work and sharing it with others. Findings from the Pew Internet & American Life Project suggest that nearly two-thirds of online teens create content at some point – from blogs to Web pages to original stories, photos, videos or other artwork they post electronically. What other creative activities are young people engaging in in their “spare” time? A wide variety of traditional endeavors, to be sure – dancing (often assisted by video games or websites) or poetry (given new life by poetry slams), for example. But they are also busy at work in many wholly new art forms or hybrids of older forms. Among these are designing video games; using animations or cartoons or video game components to produce “machinima” films; and generating “fanfic,” stories and creations that feed off popular books, movies, cartoons and other features. All this points to a broader cultural trend that values creative production and the communities that form around it. This trend is driven in part by the proliferation of technologies that put production of arts – music composition, dance, design, and visual arts, among them – within reach of anyone interested (New Opportunities for Interest-Driven Arts Learning in a Digital Age). I am an advocate of integrating the skills, knowledge, and interests related to the informal learning of children and youth into mainstream, formal educational settings. Educators can leverage these skills and interests to help students learn about school-oriented content areas resulting in both fulfillment in this needs level and learning the required content-area knowledge. This stage relates to the ability to apply what students have learned and to be able to “give back” and become involved with the betterment of the larger community (How to Apply Maslow’s Hierarchy of Needs to Education). The Internet and online forums have the potential to help learners become involved in social causes and activism. Online hobnobbing can enable youngsters to discover opportunities for community service and volunteering and can help youth shape their sense of identity. These tools also can be useful adjuncts to — and in some cases are replacing — traditional learning methods in the classroom. By becoming more intentional in their instructional strategies, educators can use the social networking skills and the desire of young people to create an atmosphere of meaningful, engaged, and authentic learning through social activism. This, in turn, helps set the stage for learners to gain feelings of self-actualization. Very useful – love the graphic! This provides some guidance as to how educators can assist our students in using technology and benefiting from the internet and social media. I’m surprised to see you write that technology cannot address the biological or physiological needs. With regard to education, what first comes to mind is accessibility to funding, which provides adequate shelter and food as a basic cost in addition to education funding. Scholarship-seeking, information-seeking to improve one’s living situation or seek out ways to budget and free social programs such as SNAP benefits. Also, students with disabilities rely on technology in order to make education accessible. There are many other examples of how technology can meet the basic biological and physiological needs of students in addition to the other needs. I have to agree with Justin and note that I couldn’t even get past that first huge error. Agriculture, which is the first technology, is how we get food. Do you not realize that the way we make clothing and shelter are also through technology? What is your definition of technology? Technology predates computers, predates, electricity. Any tool use is technology. Let’s re-think this. Thanks, Shepherd about agriculture as a form of technology but this post is focused on Educational Technology. While interesting, I have the same objections as others have expressed to Maslow’s qualitative approach in his study and have always wondered why the subjectivity inherent in the method seems to be overlooked. I am in agreement with you about his methodology BUT if the pyramid helps teachers think about the physiological and psychological needs of students, then I am all for it. Individually, I certainly use technology to address biological and physiological needs. Are you using a running app, calorie counter or medication prompt on your iphone? Do you write nutritionally balanced meal plans? Does your computer force you to take breaks after n,000 keystrokes? If you have a chronic or frightening condition, do you keep a symptom diary, do you consult WebMD, do you seek out patient communities, and buy your drugs online? Do you have an eHealth record? How is your insurer communicating with your health and medical providers, and how do you access that information? Most of this range is safe to either do or simulate in a classroom, and has important implications for how technology will express and shape community values and expectations in our lifetime. Thanks for the suggestions – I really like the idea of medication or medical prompts via smartphone as a way to address physiological needs. I too, take exception that you have said it cannot address physiological needs. What about special needs students? An app to translate sign language, an app to help a student who is speech or visually impaired, or an app that reaches autistic children all certainly helps with physiological needs. For that matter, apps for language translation. But this is beside the point. I have trouble with the basic tenets of behaviorism. For me, it’s too simplistic of a way to view the capabilities of the human brain! Nice idea,Jackie, but the biological/physiological arena also very significant to school leaders and superintendents, or anyone involved in design & maintenance of school buildings, as well as in special needs/medical conditions as suggested above! When one sees the impact on learning of high CO2 levels, low oxygen levels, poor temperature regulation etc, – physiological factors that can have an even greater impact than the quality of teaching – you realise that the technology used in environmental regulation in schools is crucial. For truly holistic education we include this dimension when studying the impact of technology in schools with our students. Tony – I think the physiological facts are the most important, yet one of the most under-considered aspect, of the learning environment. I am just skeptical that technology can directly address it. Very interesting connection between technology and Maslow’s Hierarchy of Needs! I have never thought about this connection before. I could not agree more with your claim that “one of the biggest benefits of the Internet to this generation of learners is their ability to connect with like-minded individuals . . . their tribes throughout the globe.” Since students nowadays spend most of time in the “classroom box,” it’s hard for them to find connections or assimilations outside the classroom. Yet, through technology, students are more likely to gain a sense of belongingness from some communities. Furthermore, your description of esteem needs as self-esteem, achievement, mastery, and dominance, etc. reminds me what I learned about new literacies or digital literacies in class. Thanks to technology, students are able to change the role from a passive receiver to an active producer, through which students have more dominance and autonomy in the process of learning. I am wondering what it will be like if we address Maslow’s Hierarchy of Needs with conventional literacy. 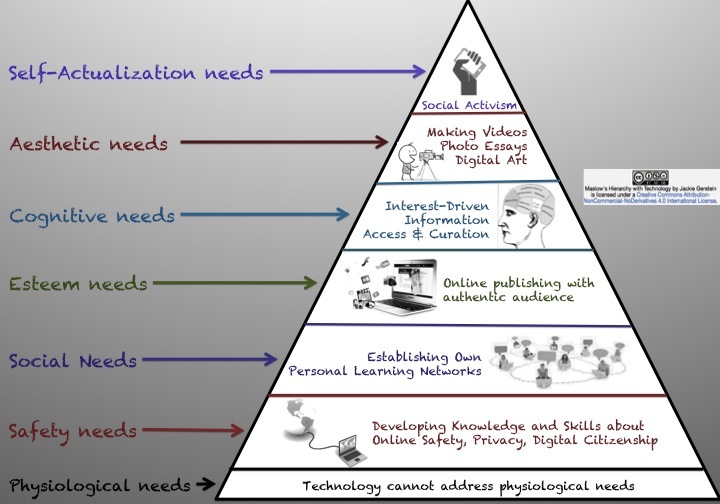 Compared with the digital literacy, will there be any difference in different levels of needs? It is wonderful to learn that others are on the same wavelength as me and the value of Maslow’s Hierarchy of Needs. I have been a huge proponent of the Needs and how technology CAN help. Specifically, I am interested in how technology can help improved the need for connection. While I believe social media has its place for students, I also believe the need for connection is more than being “friendly” and have people with which someone can communicate. I believe the need for connection is critical between a student and someone (e.g. parent(s), family, teacher, coach, priest, etc.) who is in a position to guide and mentor that student. Some type of an authority figure or similar with human the student trusts and respects. Then, when the student FEELS heard, understood and valued by that person(s) it can fulfill their need for connection. Having those same feelings with friends is also important but I do not believe it carries the same weight and value. The reason I am so passionate about this topic and Maslow’s work is because there is a website (i.e. technology) called http://www.FamilyeJournal.com that specifically strengthens family relationships using an interactive Q&A format that all family members participate daily over weeks and months time. The developers will soon be publishing a second research study showing its effectiveness with college students. I hope you will all check it out. The article on Maslow’s hierarchy of needs and the application of that thinking reflected in Hierarchy of Technology is simply superb. Hi Jackie, this is a GREAT image and article. I am co-writing a book about meeting student, parent and staff Maslow needs and would love to include this image and reference your site. Do you give permission? Sure – go for it!